The compression market is certainly a crowded and finicky one. Som runners use full-length compression socks and others that use calf sleeves. Some use them while running, others use them for recovery only. No matter what your style or method if use, if you are a fan of Injinji, you should at least take a look at their Compression 2.0 product…the only compression performance toe sock on the market. Injinji Compression is a full-length graduated compression sock using Injinji’s toe sock design. It is made of a blend of polyester, nylon, and lycra. They are designed to provide graduated compression from bottom to top of the calf in order to enhance circulation, performance, and muscle recovery. I am typically one of those finicky compression users that I mentioned at the start of the article. I usually wear calf sleeves during events so that I can easily change socks if needed and socks during recovery for the full benefit. Either way, I decided to give these a try in both scenarios so that I could provide a well-rounded review. In terms of comfort, you really need to rate compression socks a bit differently and I would rate these as positively. The compression was consistent and not overbearing. There were no spots where the sock felt or rubbed weird. On my 20 mile long run in them, never once did I have to adjust them or did I find myself wishing I would have worn different socks. Protection was a non-issue on the road. It provided a solid amount of padding underfoot to protect my feet while on the pavement. On the trail, I am not sure I like it as much. The overall feel of compression sock material tends to be a bit more abrasive in my opinion. I should call out though that I have this problem on the trails with EVERY compression sock I have tried. This is why I typically use calf sleeves and my Trail 2.0 socks when running longer trail distances. Others may be different and not have the same issues. Nothing really to note here. My feet seemed to stay a pretty consistent temperature during my long run, which indicates to me that they were pretty breathable. They didn’t feel hot whatsoever during my test runs. I also experienced no issues wearing them around for recovery during the day. I didn’t get them too wet during my use, but the bit of dampness I did experience wasn’t an issue. They do a good job at wicking away water and sweat. The Injinji Compression 2.0 offers consistent, graduated compression from the foot to the top of the sock. 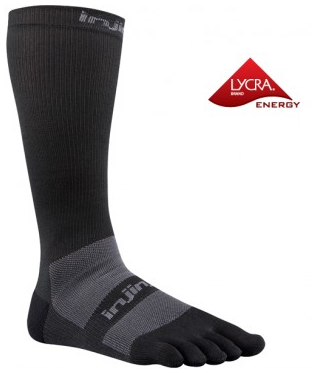 I would say that it is at least as effective as any other high quality compression sport sock on the market, plus the added benefits of individual toe design that Injinji does better than anyone. The one thing I did notice about this sock is that it does take some time to get it on. I am not saying that the time required to put them on is some long, drawn out process, but the compression material combines with the individual toe design does require a bit of patience. As far as personal preference, the materials that are required to make a good compression sock are not what I would choose for long trail runs since I prefer a thicker, softer feeling sock. The polyester/nylon/lycra blend just doesn’t provide this for me. At the same time, they provided a good experience on the road and an even better one as a post run recovery sock. It offers solid compression on top of the unique features that I love about Injinji. I am definitely glad that they decided to introduce it into their lineup. This entry was posted in Gear Reviews and tagged Accessories, compression, footwear, gear review, Injinji, product review, running, socks, trail running, ultra running, ultrarunning by Ultrarunner Joe. Bookmark the permalink.